Royal Papua New Guinea Constabulary has seen another pass out of new police officers today for the constabulary. Present to witness the ceremony was the Police Commissioner Gari Baki. Commissioner Baki thanked families, friends and the public for attending the ceremony which saw 242 new Probationary Constables passing out from the Bomana Police College. Police Intake 1 of 2016 consists of 46 women and 196 male who passed out today. Families of the recruits were also present to witness the passing out ceremony. Commissioner Baki encouraged the new recruits who passed out today at Bomana Police College to uphold the values of discipline and ethics, at all times. 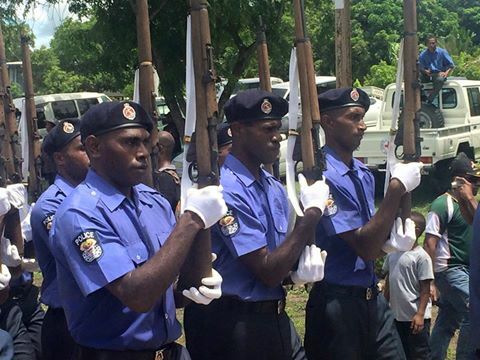 “The young men and women passing out today joined the constabulary on their own accord,” Commissioner Baki said. The police men and women were taught at the Police College how to deal with offenders by apprehending, arresting and charging them. The Police College has taught them to protect and serve the people of this nation. Commissioner Baki said life in the constabulary has many benefits but also comes with challenges along the way. He said the challenge is on the recruits passing out to work together as partners so that together they can serve the interest of the people.